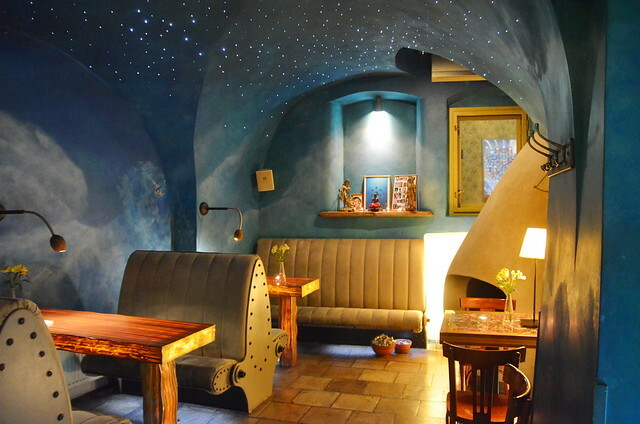 Drifting through the dusty snow we rounded the corner of Boršov—the shortest street in Prauge—where a small sign waved us into one of Paurge’s premiere vegetarian restaurant, Lehka Hlava. Behind (what an American like me considers) an ancient door this Gothic home opens into a slender atrium where a single wiry tree reaches toward the sky. 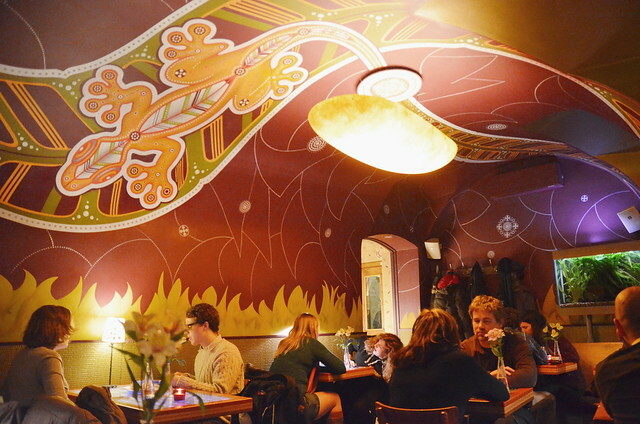 Confirming our reservation, the hostess draws us into a space where the spirit of Bohemian thrives. 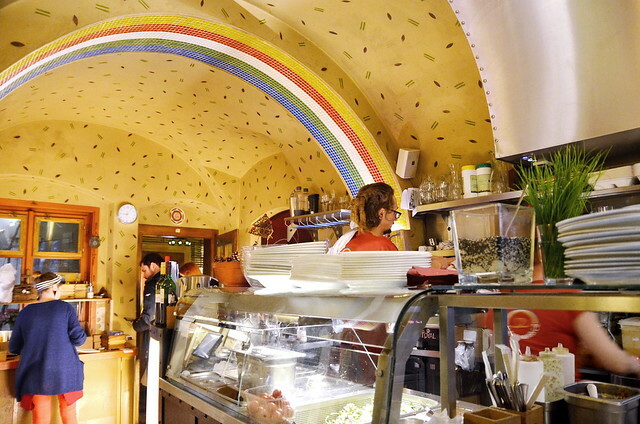 Under the fiber optic galaxy an eclectic international menu is served out of the open rainbow kitchen. Vegan items are clearly marked—along with the requisite 14 allergens. 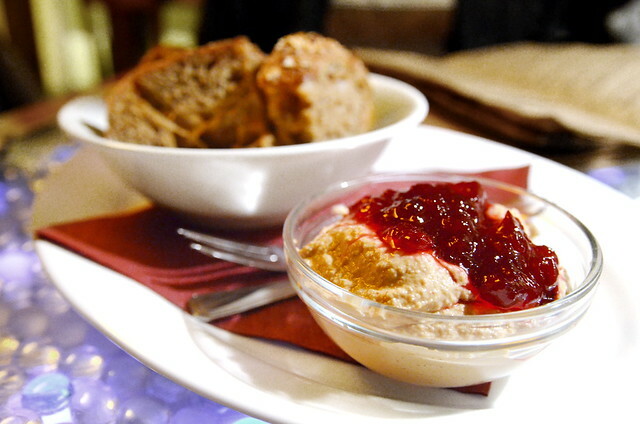 Evoking faux gras, Lehka Hlava’s Smokey Tofu Pâté blends smoked tofu with barley miso and cashews and is topped with a seemingly odd blob of cranberry sauce. Smokey, unami rich, and graced with a broad stroke of sweetness, this dish blows past any other vegan pate/gras dish I’ve tried! 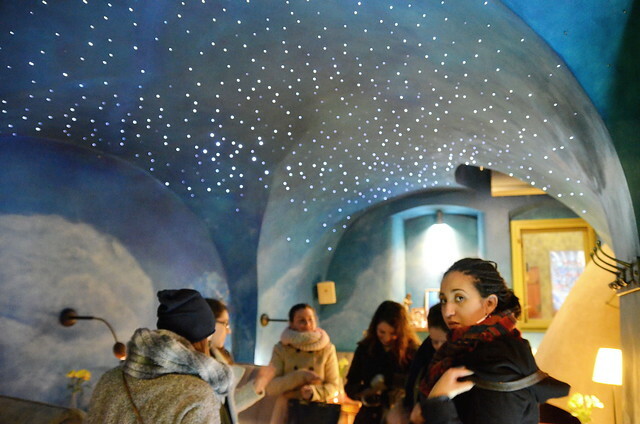 This is the best way to invest 100 Kč /$3.98 USD in the city which we did multiple times during our stay. 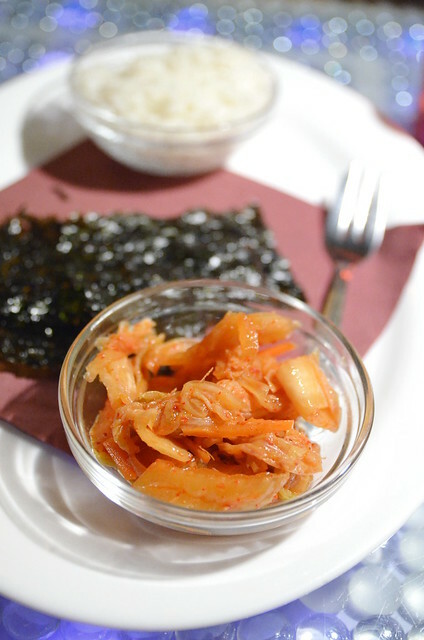 The Kimchi Tapas (115 Kč / $4.58 USD) offers a bowl of spicy probiotic napa cabbage with a scoop of sticky short grain white rice and seaweed. It’s a sort of build-your-own Korean sushi concept that puzzles after success of the smoked tofu pâté. 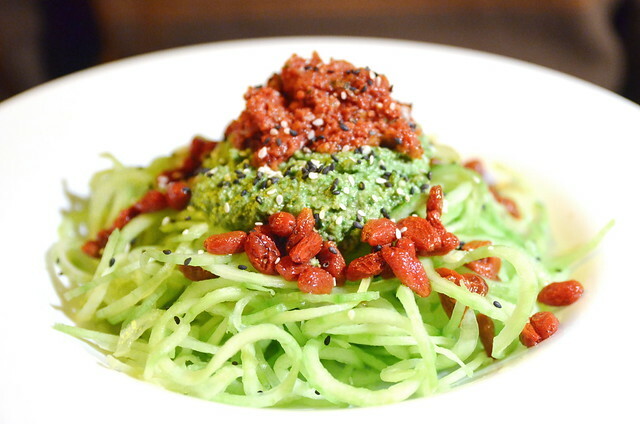 The Raw Spaghetti (225 Kč / $8.96 USD) arrives as a mound of spiralized cucumbers topped with a heavy dollop of avocado and spinach pesto, with ground cashew nuts, garlic and then another heavy dollop of sundried tomato pesto. The dish is finished with a sprinkle of sesame seeds and soaked goji berries. An odd combination on paper, but when it’s all mashed up in my mouth, the sweetness of the goji berries and sharpness of pesto sing and dance in harmony. 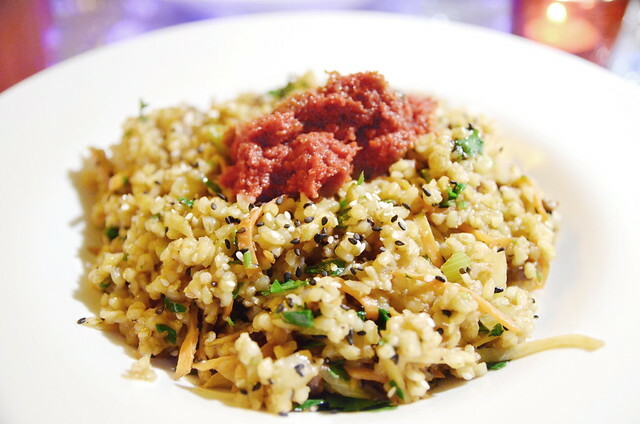 Tender whole grains cling to each other in the Bulgur Risoto (165 Kč / $6.63 USD). The nutty based is mixed with smoked tempeh, julienne carrot and fennel, and topped with a rich and tart sundried tomato pesto. Hearty and filling for a winter night, singed with the soft smoke of the cracking fire we lit later that night in our hotel room. 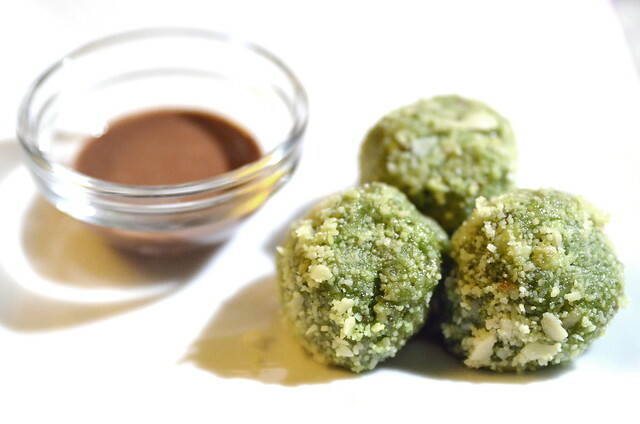 For dessert, the Raw Nut Balls (75 Kč / $3 USD) come dashed with Japanese matcha powder and a side of rosewater dipping chocolate. Floral, delicate, and delicious. Raw home-made Cheesecake (125 Kč / $5.09 usd) is an 2 inch wedge of fluffy whipped cashews and walnuts doused in vanilla poached raspberries sauce. 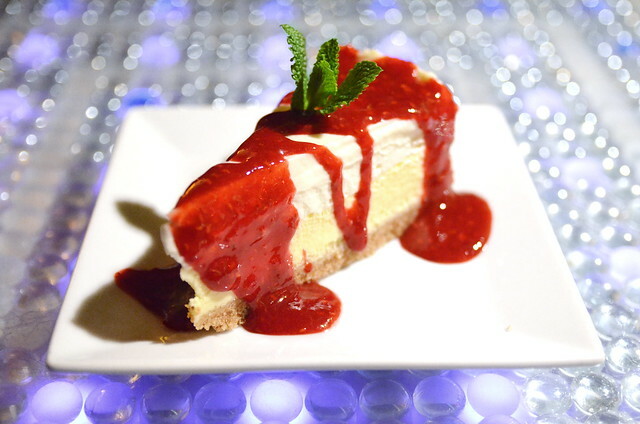 The finale is loaded with sweetness backed up against the tartness of lemon spiked cream and piquant berries. Our fork tines clinked as we stabbed to the dish, scraping up every last bite.